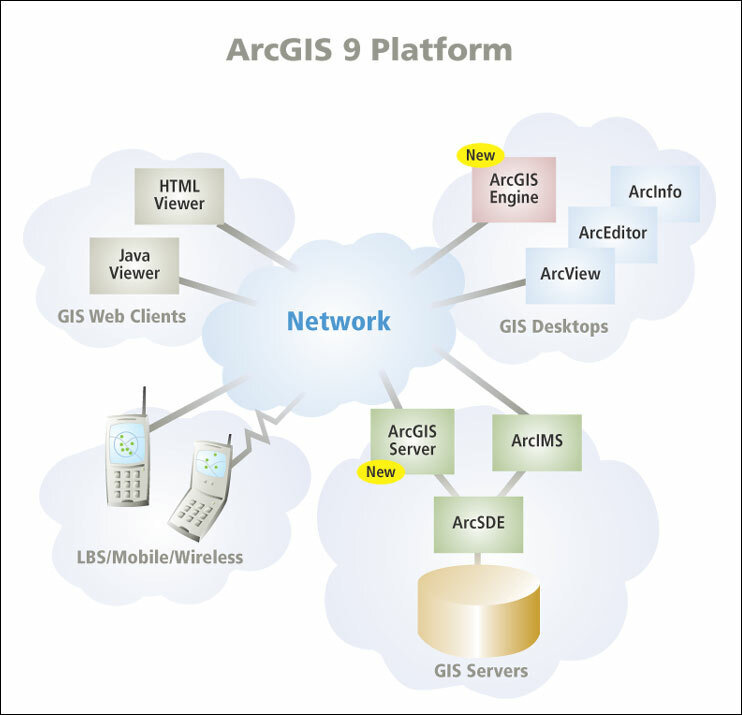 ArcGIS 9 introduces a comprehensive GIS development platform for deploying GIS functionality on both the server and the desktop. This advancement enables organizations to disseminate focused GIS functionality, such as geocoding, editing, and tracing, to end users who are not GIS analysts. 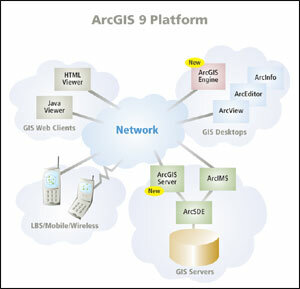 At ArcGIS 9, this development platform encompasses a set of products that contains generic GIS components known as ArcObjects. ArcObjects components have been the foundation of the ArcGIS 8.x Desktop products (ArcView, ArcEditor, and ArcInfo) for several years. With ArcGIS 9, these components will also be available in two new products: ArcGIS Server and ArcGIS Engine. ArcGIS Server is a GIS enterprise application server, while ArcGIS Engine is used to create custom GIS desktop applications. Together ArcGIS Desktop, ArcGIS Server, and ArcGIS Engine become a comprehensive GIS development platform for deploying GIS functionality anywhere. This approach of supplying a set of ArcObjects components for both the server and the desktop provides users flexibility, interoperability, consistency, and efficiency when building geographic applications at the project level, at the department level, or for the enterprise. Flexibility arises from the ability to deploy GIS functionality on the server (ArcGIS Server), in custom applications (ArcGIS Engine), or in commercial off-the-shelf applications (ArcView, ArcEditor, ArcInfo). Interoperability is the result of ArcGIS Server and ArcGIS Engine software's support of multiple operating systems, database management systems, and development environments (.NET, Java, and COM). Since the same generic components are used consistently on the server and desktop, solution builders become efficient as they gain experience with the ArcObjects development environment. ArcGIS Server is the first GIS enterprise application server that provides GIS capabilities, such as mapping, geocoding, spatial queries, editing, tracing, and high-end analysis, throughout an organization from a central location. ArcGIS Server implements the GIS business logic in an IT standards-based server environment that was previously available only in GIS desktop solutions. These capabilities can be accessed by browser-based clients, custom applications built with ArcGIS Engine, and ArcGIS Desktop. Completing the vision of GIS functionality anywhere, ArcGIS Engine is a set of cross-platform components used to build custom GIS and mapping desktop applications or add new functionality to existing applications. Applications built using ArcGIS Engine can be stand-alone desktop applications or act as clients to ArcGIS Server. ArcGIS Engine applications can vary from simple map viewers to custom GIS editing and analysis programs. ArcGIS Engine provides application programming interfaces (APIs) for .NET, Java, and COM. ArcGIS Server and ArcGIS Engine are new products that will become available at version 9. For more information on the new features available at ArcGIS 9, visit www.esri.com/arcgis9, call Esri at 1-800-447-9778, call your Esri regional office, or contact your local reseller. Outside the United States, please contact your local Esri distributor. See also "ArcGIS Server: Creating a Centrally Managed GIS."